Over fifty people had decided the lecture at the Bram Center was worth hearing. I was one of them. Wandering through the open-air market in Jerusalem, I found myself with some time to spare. After buying sweet and luscious clementines, nuts, and bananas, I meandered into the Klal building and found the Celebration Hall where The Bram Center was to hold a lecture. The Bram Center is only four months old, and the name comes from Abram (Bram) Poljak. He was a Messianic Jew who came to faith in the 1900s and was one of the pioneers of the first Messianic Jewish congregations in Israel. The vision of the Bram Center focuses on Yeshua faith, traditional Torah observance, and the Land of Israel. I watched the room fill up with happy and smiling people, drinking soda and eating the early hamantashen that Boaz had brought from the shuk. Old friends, some whom I hadn't seen in years, ambled into the newly renovated room in which two local congregations meet and signed their names to a mailing list. First Fruits of Zion displayed their new 6-book Torah Club: Shadows of the Messiah, and young people from six months old to elderly cheerfully entered the room and greeted old friends. The mood was festive and there was a palpable excitement in the air as over fifty people had decided this was a lecture worth hearing. Boaz introduced the evening by speaking of the vision of the Bram Center and how important it is to have an informed and relevant worldview, encompassing the overriding principles mentioned. A scholar in his own right, he spoke of the necessity of challenging our basic ideas and core assumptions. This requires engagement with history and our corporate Messianic Jewish perspective. Dr. Daniel Juster was the guest speaker for the evening. He had been asked to describe the various theologies that had shaped his worldview. Some of the issues that are being debated are present in Israel, particularly among those in leadership. Boaz introduced Dr. Daniel Juster and honored him as a man who always graciously encouraged him to thoughtfully consider his own faith and worldview. Dan sauntered up to the podium and began his lecture. He raised some significant and interesting points. The crowd was attentive and very quiet. Some were scratching notes in long hand, and others wrote on tablets. Dan explained that there are conflicting theologies within Christianity, and that he has developed his own Messianic Jewish theology, which evolved out of problems he encountered within each Christian approach. He explained quite a bit regarding the origins of dispensationalism as opposed to covenant theology. Both streams have their drawbacks and Dan went on to say that law and grace were not separate issues, but, indeed, were the very essence of both testaments of the Bible. The church, in Dan's view, should be an expanded Israel without doing away with ethnic Israel. This joining together will be, ultimately, for the sake of world redemption. He went on to say that all covenants are covenants of faith. Dan takes umbrage with leaders who say that the rabbinic traditions are not from God. He argues that God has given us traditions that enhance our lives. The question and answer period was lively. 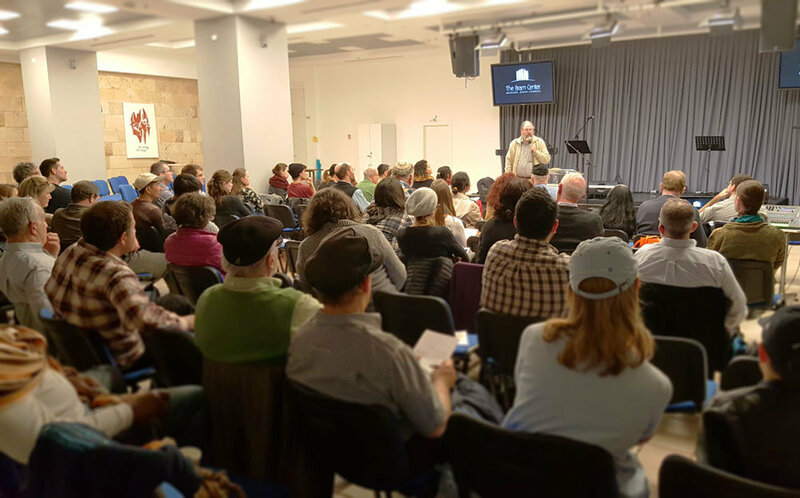 Many in attendance are Hebrew-speaking, Torah observant, Messianic Jews, and the lecture solidified our perspective. The lecture and question and answer time had finished. A raffle was drawn in which Shadows of the Messiah was given away. This is one of the many informative resources available from First Fruits of Zion, and presents an "eye opening look at the person of the Messiah revealed within the Torah." Throughout the night, many people had leafed through it and some wanted to own it. People gathered in small groups to discuss the issues that had been brought forth and to catch up with old friends. Rides home were arranged and I walked out into the lovely springlike evening. I walked past the now-closed market, having happily engaged with a section of our community that is zealous for our traditions and a meaningful way to express our faith and interact with our people. The focus of the Bram Center is to seek our own community, while challenging evangelistic theological paradigms. We must be aware of the many influences that have, perhaps incorrectly, shaped our thinking. And, we must be willing to challenge them in a thoughtful and coherent manner. 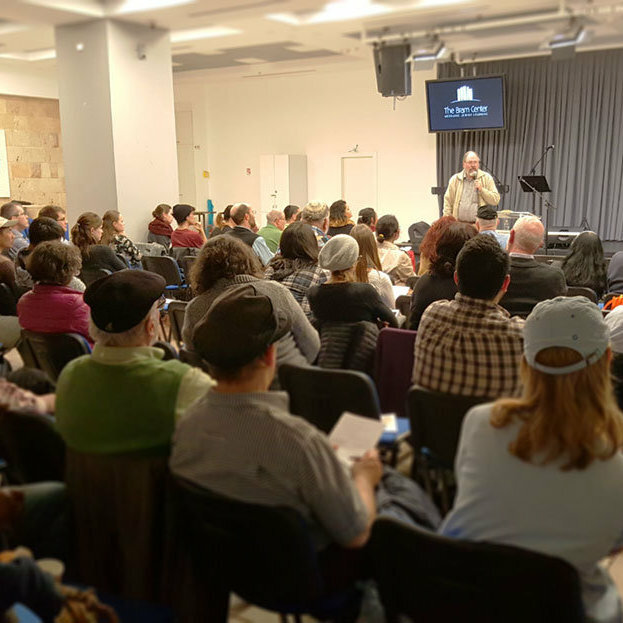 The mission of The Bram Center is to expand the influence to the wider Messianic community in Israel and throughout the rest of the world. Click here to download the full transcript of Dan Juster's lecture.